When asked about a good boot for young men with growing feet, this men's cowboy boot is a good choice. Affordably priced and with a durable sole for those high school sidewalks, the tan bomber leather is a comfortable favorite. Easy to re-sole. Just use mink oil to protect it. Guys call this boot "Denver". 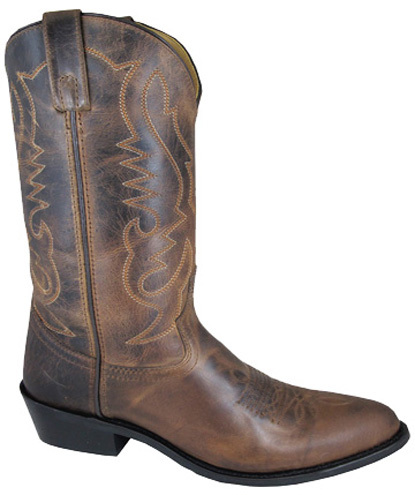 For an easy to wear, easy to keep, starter cowboy boot, this leather matches almost everything. The color shifts as the oil in the leather is bent, or creased. It always looks good & feels as great as it looks! Did you know that the stitching patterns on top of your foot are to make the boot break in for better comfort? Stitching on the shaft allows some good looks and keeps the top from bagging around your ankles. DESCRIPTION: LEATHER WESTERN BOOT with Tricot Lining. Heel is standard Slight Underslung Walking Western. OUTSOLE: RUBBER with Steel Shank. Goodyear Welt.